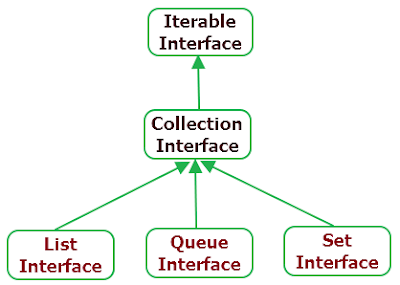 Collection is an interface in java. Collection interface extends Iterable interface. 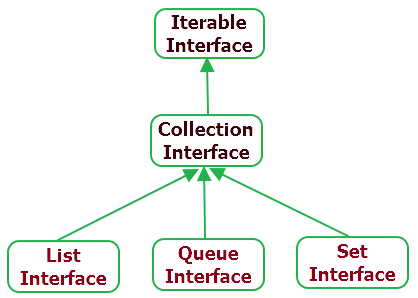 In hierarchy, Collection interface is root of List, Queue and Set interfaces. It represents unit of its elements. i.e. group of objects. Some collections do not allow duplicate elements but some allows duplicate elements. Collection interface is base on which collection framework is built. Collection interface contains basic operation methods as bellow. boolean add(E element) - To make sure that this collection contains the specified element. It will return true if object is added to collection. Return false if object is already there and collection does not allow duplicates. boolean contains(Object element) - It will return true if collection already have specified element. boolean isEmpty() - Return true if collection is empty. Iterator<E> iterator() - It will return an iterator for the invoking collection. boolean remove(Object element) - It will remove single instance of given element from collection. Return true if it is present else it will return false. int size() - It will return number of elements present in invoking collection. Collection interface also contains methods that operate on entire collections as bellow. boolean addAll(Collection<? extends E> c) - It will add all elements of c to the invoking collection. Return true if operation was success else it will return false. boolean containsAll(Collection<?> c) - It will return true if this collection contains all the elements of specified collection. void clear() - It will remove all the elements from invoking collection. boolean removeAll(Collection<?> c) - It will remove all those elements from invoking collection which are available in c. It will return true if given elements removed else it will return false. boolean retainAll(Collection<?> c) - Retains all the elements in invoking collection which are available in c.
Also there are methods to perform array operations as bellow. Object toArray() - Return array of elements from invoking collection. <T> T toArray(T a) - Return array of all those elements from collection. // Add items in ArrayList. // Get collection Items list. // Get size of collection. // Remove item from collection. // Add items in LinkedList. So this is basic idea of root collection interface. We will learn different child interfaces of collection interface one by one to get idea about how collection interface works. I need your help regarding selenium webdriver issues faced by me so i can we contact on skype. you can contact me on my skype account "sumitbaindi".